Just sharing some testimonials from retirees who have used my site. I don't often put one here, never remember... but every so often, someone like Zaida steps forward and simply WOWs me. THAT is why I do this site. I am just sending you a quick note to thank you for this wonderful resource, and all of the great information you provide. I have been blessed by so much of it, and I eagerly look forward to your newsletters. I cannot honestly say I do the same for other information I receive on a consistent basis. Retirement has definitely had it's challenges for me, but as soon as I hit a little slump, your newsletter seems to arrive right in the nick of time. I pray you know what a true blessing you are to so many. Have a great week and thank you also for sharing about your visit to the VA hospital. How blessed are we to have such extraordinary men and women to give of themselves in such an unselfish way. Back in early June I sent a letter to your web site. You have so many letters, you won't remember, but it told of how my wife and I moved to our retirement home in Arizona, but I just could not adapt, and eventually sold the house. I never expected any response, or to even have you use it, but you did. I received many comments from people who are dealing with the same problems. I wanted to thank you for the work you do on behalf of all the people struggling with retirement. You truly make a difference. 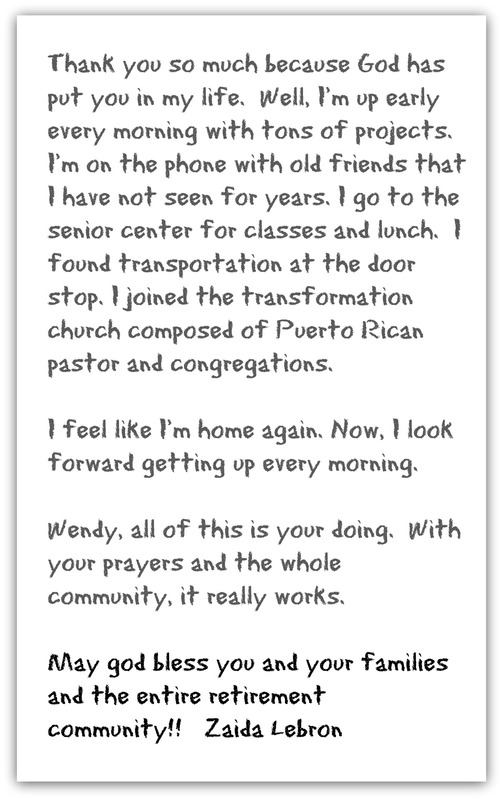 As for the kind people who responded to my letter, I will continue to hope they find peace. One good thing has happened. We were fortunate enough to rent next winter in the very same 55+ community where we had our home. It's going to take time to overcome the pain and guilt of acting too quickly on selling my home. Knowing there are people like you and your contributors makes it easier to cope. Please continue this wonderful work you do, and thank you so much. I love your website! It's been my salvation many days! Thank you from the bottom of my heart for this wonderful website and all you do! I have met some really nice people through you website. I have gotten busy due to it being summer so I don't have as much time to interact as I did before, but I will be back. Thank you! I enjoy getting your emails. I'm not retired as of yet but I am collecting information to prepare for the future. Please keep 'em coming. I am good. I do find your website and what it shares very helpful. Thank you. I just want to thank you from the bottom of my heart for starting Retirement Online.You and your following have helped me navigate through my retirement journey. I was "lost at sea". With the advise of you and others, I have slowly rediscovered myself, joined a gym, spent invaluable time with my healthy 80 yr old parents, cleaned my house, enjoy spending time with my husband. In the beginning I would become tearful missing the healthcare workplace. I dont miss the hectic pace, I miss the social aspect of working. I was recently offered a part time consultant job in my field. I will utilize some of my skills in a much less fast-paced environment. I will also be working with some of my former coworkers! Thank you again for your help through my retirement journey. I have learned so much about myself in the past year and half. I know one day I will be able to help someone navigate through their retirement adjustment! You are an intelligent, wise woman to bring this website to us! Good luck with all of your projects. I enjoy your site and reading how other's cope with retirement. It bothers me that people complain about something that could help them! Is it when we reach a certain age we get so cemented in our thinking we can't be open to new ideas? Please be assured I would like to continue to hear from you and other members. Do you have something to share about Retirement-Online.com?